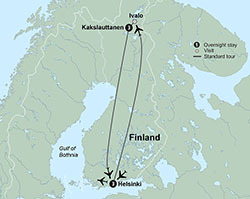 On-tour round-trip flight from Helsinki to Ivalo not included and must be purchased through Collette Vacations to participate in this tour. Single and triple accommodations are not available for this tour. Extra nights in Helsinki are available for an additional charge. Plan now to set off in search of the shimmering Aurora Borealis, or Northern Lights, on a new Collette guided vacation of Finland this fall. Learn about Finnish culture and history on a tour of Helsinki with a local expert. Savor the local cuisine in Helsinki’s restaurants. Experience rugged Lapland during a three-night stay in the north of Finland. Overnight surrounded by wilderness in a glass igloo and a Finnish log cabin. Sip warm berry juice, a Finnish winter tradition. Meet Santa Claus in his home. Embark on a reindeer safari with a local farmer. Mush your way to breakfast in a Finnish sleigh, leading your own dog sled team. One dynamic experience follows another on this once-in-a-lifetime adventure through Finland. Your adventure opens in Helsinki, a city with a vibrant architectural style that blends classicism and functionalism. This evening gather with your fellow travelers for a Welcome Dinner in the city center. Join a Local Guide for an engaging city tour. Visit Senate Square, the heart of Helsinki. Designed by famous architect Carl Ludvig Engel, it is home to the city’s most iconic building, the Helsinki Cathedral. Continue your exploration on foot as you make your way through the historic streets of Tori Quarters, where the old city meets the new. Enjoy some free time in Market Square and discover the local flavors. Next see Kaivopuisto Park, an ornate neighborhood overlooking the sea that is home to beautiful embassies and villas. This afternoon explore Helsinki on your own, or choose an optional excursion to Porvoo and catch a glimpse of 19th-century daily life in this charming town. A scenic drive along the Porvoo River brings you to the town’s iconic red-painted storage houses traditionally used to store delicacies from foreign lands. Board your flight for Lapland, Finland’s rugged northern region. (On-tour flight is not included and must be purchased through Collette Vacations to participate in this tour.) Known for its unique culture, this mythical land offers up views of the Northern Lights, reindeer encounters and Arctic treasures. This afternoon explore the splendor of the Kakslauttanen Arctic Resort with its glass and snow igloos, ice chapel, Finnish sauna and intricate native artwork. Spend the next two evenings in your personal Finnish log cabin equipped with a private fireplace and sauna. Join your fellow travelers on a trek as you travel north towards Inari, making stops along the way for the best views of the Northern Lights (weather and atmospheric conditions permitting). Stop to gaze at the sky above and be amazed at the dancing colors in the sky. Awake amidst the dramatic scenery. Experience the nature around you as you mush your way to breakfast in a Finnish sleigh. Learn the origins of Santa Claus during a meet-and-greet session at his home. The Christmas cheer is an undeniable component of Lappish culture. This evening explore the remote areas of Kakslauttanen on a reindeer safari. A reindeer farmer introduces you to your companions, the Finnish reindeer! Sip a traditional Lappish drink of warm berry juice as you sleigh through the unspoiled wilderness. Cozy under the blankets, you can continue your search for the Northern Lights (weather and atmospheric conditions permitting). Begin an exquisite day in the Arctic as commander of your own dog sled team! Cute, fast and born to lead, these huskies will show you the way through the snowcapped scenery. Become acquainted with the dogs, the commands and the equipment before embarking on your adventure. Enjoy your last night in Kakslauttanen in the most unique way. In the heart of Lappish wilderness, you may find the Northern Lights dancing over your private glass igloo (weather and atmospheric conditions permitting). This morning say farewell to Lapland as you board your flight back to Helsinki. (On-tour flight is not included and must be purchased through Collette Vacations to participate in this tour.) Your afternoon is free for you to explore the city’s central squares, charming shops and the latest Finnish trends. This evening celebrate your journey with your fellow travelers during a Farewell Dinner in downtown Helsinki. Share your memories, photos and unforgettable Lappish experiences. Call 855.645.2215 to Book Your Northern Lights of Finland Tour Today! Bluegreen Travel Services can book all your travel needs. Call us for details and pricing on airfare, hotels, cruises, tours, rental cars & more. All reservations are subject to availability. Follow @TravelerPlus on Twitter for daily travel deals! *TRAVELER PLUS POINTS-FOR-TRAVEL BENEFIT TERMS & CONDITIONS: In order to apply any combination of annual, biennial, borrowed or rented Bluegreen Vacations Points for payment, escorted tour fare, including base fare and taxes, must be a minimum of $500 per person for the first and second passengers in a cabin, for a total minimum fare of $1,000. Benefit applies only to active Traveler Plus members. Prices based on availability, per person double occupancy and subject to change without notice. Includes accommodations; 11 meals; on-tour motorcoach transportation; guided sightseeing; admission to attractions; hotel luggage handling; and taxes and applicable gratuities for bellmen, doorman and dining room wait staff. Customary and voluntary gratuities for hotel housekeeping staff, local sightseeing guides, drivers and tour managers are not included. On-tour, round-trip flight from Helsinki to Ivalo not included and must be purchased through Collette Vacations to participate in this tour. See full Terms and Conditions. Price is per-person based on double occupancy, including accommodations; 11 meals; on-tour motorcoach transportation; guided sightseeing; admission to attractions; hotel luggage handling; and taxes and applicable gratuities for bellmen, doorman and dining room wait staff. Customary and voluntary gratuities for hotel housekeeping staff, local sightseeing guides, drivers and tour managers are not included. On-tour, round-trip flight from Helsinki to Ivalo not included and must be purchased through Collette Vacations to participate in this tour. Prices and availability are subject to change without notice. Fares shown are in U.S. dollars for new reservations only and are subject to availability. Please call us at 800.459.1597 for more information. This offer may not be combined with any other offer/promotion and may be withdrawn at any time. Airfare, airport transfers, car rental, optional tours and attraction tickets, and items of a personal nature are not included. Great Vacation Destinations, Inc., doing business as Bluegreen Travel Services, is located at 12400 S. International Drive, Orlando, FL 32821. Great Vacation Destinations, Inc. is registered with the State of California as a Seller of travel Reg. No. 2068362-50 (registration as a seller of travel does not constitute approval by the State of California); Washington Seller of travel Reg. No. 602-283-711; and registered with the Airlines Reporting Corporation (“ARC”) number 15-72225-4. In the event of a conflict between Collette Vacations’ Details of Participation and Great Vacation Destinations Details of Participation, Collette Vacations’ Details of Participation will govern. Bluegreen, Bluegreen Resorts, Bluegreen Vacation Club, Bluegreen Vacations, Bluegreen Vacations Share Happiness, Bluegreen Rewards, Bluegreen Traveler Plus, Bluegreen Getaways, Outdoor Traveler, and their respective logos are registered or unregistered trademarks or service marks of Bluegreen Vacations Corporation and are used under license. Resort names are trademarks of their respective resorts and are used with permission. Bass Pro Shops® and the Bass Pro Shops® logo are registered trademarks of Bass Pro Intellectual Property, LLC. Big Cedar® is a registered trademark of Big Cedar, LLC and used under license. Choice Hotels, Choice Privileges points and the Choice Hotels logo are owned and operated by Choice Hotels International, Inc. and are used with permission. All rights reserved. All other marks remain the property of their respective owners. Bluegreen Vacations Unlimited, Inc. is a registered Florida seller of travel, license no. ST36225. Void where prohibited by law and where registration and/or licensing requirements have not been met. This advertising material is being used for the purpose of soliciting the sale of timeshare interests. This advertising material is being used for the purpose of soliciting the sale of time-share property or interests in time-share property.